The VC300 from Voice Caddie is a unique product in the GPS rangefinder market. As you know, most rangefinders include a visual display which informs you as to the distance between yourself and the target. There are plenty of handheld models on the market, as well as those that you can wear on your wrist or mount on your cart. However, the Voice Caddie VC300 goes in a completely different direction. Instead of showing you the distance, this device tells you the distance – out loud. Is this a good thing? Well, that depends. Before the round begins, you will need to turn on the device and attach it to the bill of your visor or hat. It will take a few minutes for the device to recognize the course you are playing, so you will want to switch it on while you are warming up. Once your round begins, operation couldn’t be easier – anytime you would like to request a yardage, you simply swipe your finger across the surface of the unit and it will read you three numbers. The first number is the distance to the front of the green, the second is the middle, and the third is the back. With your yardages provided, you can go ahead and hit your shot. After the round is completed, you will want to recharge the unit so it is ready for your next round. There are a total of eight languages available on the VC300 – English, Spanish, German, Italian, French, Japanese, Chinese, Korean, and Swedish. Also, the volume can be set to one of seven levels so you can set it to a point that allows you to hear the yardage without bothering others in your group. 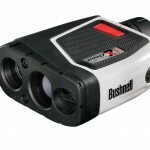 Right off the bat, the main positive of this GPS rangefinder is obvious – it is extremely easy to use. With just one swipe of your finger, you will have the yardages you need and you can be on your way. You don’t have to fumble for a handheld unit being stored in your bag or cart, and you don’t have to wear anything on your wrist. The unit is mostly ‘out of sight, out of mind’, until you need it to do its job. Also, those with vision issues will appreciate the fact that they don’t have to read a screen under bright sunlight. Some golfers find it difficult to read the display on a traditional GPS, which can slow them down during play. That isn’t an issue that is faced with the VC300 from Voice Caddie. As long as you can hear the yardage that is being announced, you will be good to go. One other positive that needs to be mentioned is the price. The VC300 can often be had for less than $100, which is a significant savings over many of the other products on the market today. If you have been wanting to add some technology to your game without having to break the bank at the same time, the Voice Caddie is a product that deserves your attention. Of course, there are some negatives that come along with any product, and that is true in this case as well. First and foremost, the VC300 offers up a very limited amount of information. The only data you will be receiving with regard to course measurements is the yardage to the front, middle, and back of the green. While those are important pieces of information, you may need other numbers in order to plan your shots properly. For example, if you need to know how far you have to clear a bunker or a water hazard, you will be out of luck. That is a significant drawback of this product. The other negative that needs to be highlighted is one that you are probably already thinking – the noise that comes along with this unit. Golf is a quiet game, and when you do make noise, you have to make sure you do so at the right time. Making noise while someone else hits a shot is a major no-no in golf. 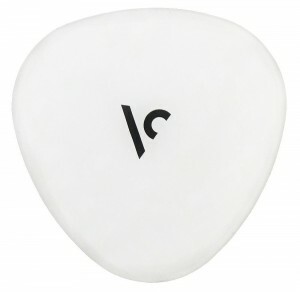 While you won’t swipe your finger on the VC300 while another golfer is playing, there is always the chance that it could make a noise unexpectedly at just the wrong time. This is why most people switch off their cell phones while on the course – you don’t want to be the person that interrupts the silence. In addition to the threat of making noise at the wrong time, there is also the foreign concept of having ‘manufactured noise’ during your round. Many people play golf in part to enjoy the beauty and peaceful setting of the golf course – and that setting might be disturbed by having an automated voice reading off numbers. This point is more a matter of personal preference than a true pro or con, but it is something to think about. In the end, it is hard to see the positives of this product outweighing the drawbacks that it presents. Sure, there is the convenience of the easy-to-use system, but you are only going to get limited information through that interface. The lack of more in-depth data is really the undoing of this unit. Unless you are a casual golfer who is not too concerned with planning your way around specific hazards and obstacles, you will likely want to opt for a unit capable of providing more information. 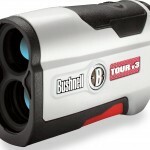 The VC300 by Voice Caddie gets high marks for ingenuity and creativity, but overall there are better rangefinders on the market.